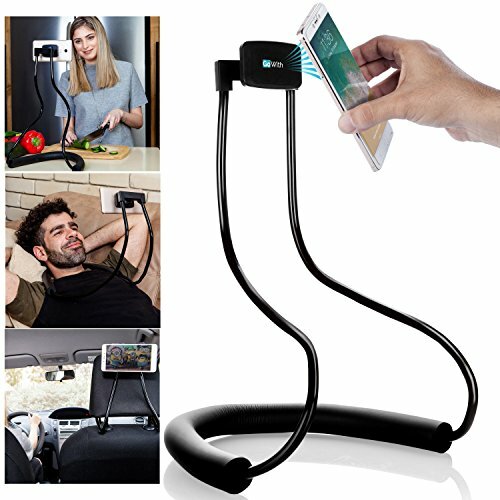 VERSATILE MOBILE HOLDER: Get the magnetic cell phone holder and put it on a table, the ground or bed to watch videos hands-free! You can also strap it around your neck, or even mount it on your car or bicycle steering wheel. FOR YOUR PHONE AND TABLET: You can use the lazy bracket phone holder both with your mobile phone and tablet. Whether you have an iPhone,iPad, a Samsung or any other device, it is 100% compatible with the GoWith phone stand. STURDY AND SAFE: Unlike plastic phone holders, the GoWith magnetic cell phone holder is incredibly durable and sturdy. The powerful magnet of the rotating gooseneck phone stand can withstand the weight of your device and keep it securely in place! ABLE AND EASY TO USE: The flexible lazy bracket phone stand has a 360° rotating phone holder, so that you can find themost comfortable angle with the best visibility. Adjusting the angle is easy and effortless! CARRY IT AROUND IN YOUR POCKET: You can disassemble the GoWith magnetic cell phone holder and put it in your bag or pocket. Then, when it will come in handy, you can easilyr eassemble it and use it wherever you are! Was cool, but became uncool really quick. Use this while cooking or working to increase hands-free multi-tasking and productivity while using your smartphone or tablet, also ideal for relaxing hands-free. Let this stand hold your device up for you! Looks funny but works great! Cool idea for someone that sleeps on there back. Or great for long car rides.